Few shopping experiences are more satisfying than a day spent thrifting. Sorting through piles of old clothes, searching for incredible deals on designer items, or just finding a wonky piece of décor is elating. Whether you’re seeking a savvy deal or interested in saving a few bucks on last year’s trends, these 10 great thrift stores won’t disappoint. Second Chance Thrift in Virginia Beach has won The Virginian Pilot’s “Best Of” Contest for seven years running. Every Wednesday, seniors get 20 percent off and military, law enforcement, fire and EMT get 10 percent off their purchase every day. A portion of the proceeds goes to support the Virginia Beach SPCA. The store is huge, offering lightly used clothing, figurines, furniture, dishware, and more. Get a great deal and support a good cause while you do it. Glamour Magazine listed Thrift Store USA in Norfolk, Virginia, as one of the best thrift stores in America, and with 24,000 square-feet to sort through, there’s a good chance they’re right. Yahoo! And PRweb.com have also praised the store for their gigantic selection of furniture, vintage items, books, records, DVDs, knick-knacks, sporting equipment, kitchenware, clothes… everything and anything you might think of. 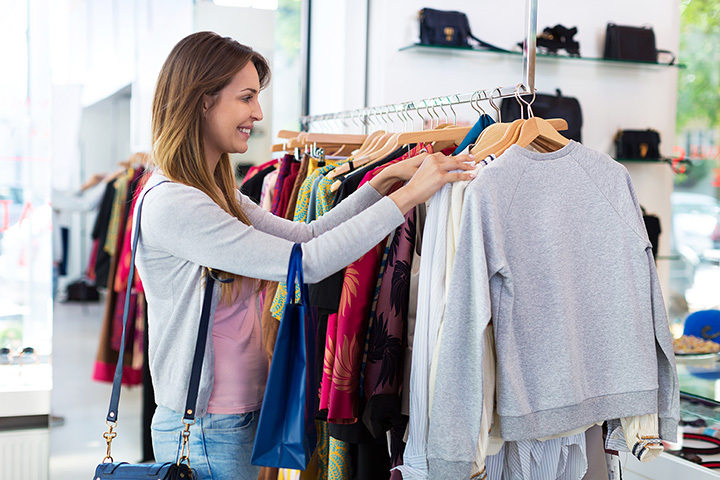 Thrift Store USA captures the joy of thrifting as well as any store on this list and has tremendous untapped treasure waiting for you. Citing the owner’s description as “Modern. Bold. Eco-Friendly,” Earth911.com recently listed Current Boutique as one of the “Best Thrift Shops in the U.S.” Current Boutique specializes in linen, silk, cashmere and wool, supplying only the best, lightly used designer items. Of course, that means they’re always buying, too. If you’re looking for lightly used high-end items, Current is the place for you. One of Buzzfeed’s “19 Insanely Unique Thrift Shops You Need to Visit ASAP,” Rumors Boutique in Richmond, Virginia, provides “the south with pre-selected and pre-loved clothing for guys and girl.” Clothing is reasonably priced, always unique, and available for purchase or trade. Check out their website for an up to date inventory as well as their brick and mortar store for the latest accessories, shoes, bottoms, dresses, tops, swim and outerwear, and men’s clothing. Sequels in Fredericksburg, Virginia, considers itself an “upscale ladies resale boutique.” Interested in lightly used designer and name brands? Check. Need a perfect piece of jewelry to go with your outfit but don’t want to break the bank? Look no further. Stop by the shop that customers call their “happy place” to browse, buy, or set up an appointment to sell your in-season wares. The Twig thrift shop in Alexandria, Virginia, was founded to support The Twig foundation—“an organization of women dedicated to providing financial aid, volunteer service, and support to Alexandria hospital.” The shop has a large variety of clothing, ranging from designer attire to less popular clothing lines, vintage jewelry, out-of-print books, furniture, home accessories, and pet supplies. Check out the retail shop every month for different seasonal wares. The Disable American Veterans (DAV) thrift stores have served the Hampton Roads area for over 30 years. Now with eight locations, including one in Gloucester, Williamsburg, Newport News, Chesapeake, Smithfield, Hampton, and two in Virginia Beach, you’re never too far to stop by. Profits from the DAV stores go directly to helping veterans. Each store has thousands of items including clothing, furniture, jewelry, pictures, books, cards shoes, ties, belts, TVs, and more. The Treasure Hound in Chantilly, Virginia, is an extension of the Friends of Homeless Animals organization, but don’t let that fool you—the retail shop has an incredible selection. An upscale resale shop, The Treasure Hound sells new and antique furniture, decorative household items, art, linens, collectibles, clothing, books, jewelry, and media. Oh, and you can bring your furry friend with you while you shop. That’s always a plus. Woodbridge, Virginia’s Village thrift store is known for their discounts. Mondays generally have half off or 33 percent off offers, making their already reasonable prices downright steals. Thousands of items come onto the floor every day ranging from books, shoes, linens, electronics, toys, games, and clothes. Bring your recycling to the store instead of throwing it away to contribute to their “Going Green” initiatives. Twice is Nice sells designer fashions, collectible antiques, and home furnishings in Charlottesville, Virginia. For over 22 years, Twice is Nice has operated as a non-profit, generating revenue to help seniors living in JABA’s Mountainside Senior Living Center. New arrivals hit the shelves daily. Next time you’re considering a new wardrobe, drop your old stuff off and pick up lightly used clothes here!